Finnish "apocalyptic death rock" band BEASTMILK has parted ways with guitarist and co-founding member Johan "Goatspeed" Snell and has changed its name to GRAVE PLEASURES. Says the band in a statement: "We ask you to understand that both sides did absolutely everything they could to make things work, but were unable to find a way to continue together. "We all wish Johan the very best, but the show must go on. "Given these circumstances, BEASTMILK will continue to forge ahead, but will assume the new identity of GRAVE PLEASURES. "The band is on atomic fire, with a new album and new members in our ranks. "We look forward to seeing you at all of the shows, where we will play your favourite BEASTMILK tracks, alongside brand new material from the forthcoming album. "Along with the name change, new live/studio guitarist Juho Vanhanen (ORANSSI PAZUZU) has joined the band, while guitarist Snell departs the ranks. "Juho V. is welcomed into GRAVE PLEASURES by frontman Kvohst, bassist Arino and guitarist Linnéa Olsson (THE OATH, SONIC RITUAL), who joined the band earlier in 2014. "The band can also reveal that they will be signing a major label deal and that they will go into the studio in May with producer Tom Dalgety (ROYAL BLOOD, KILLING JOKE), with the album set for release in September, followed by a European tour." 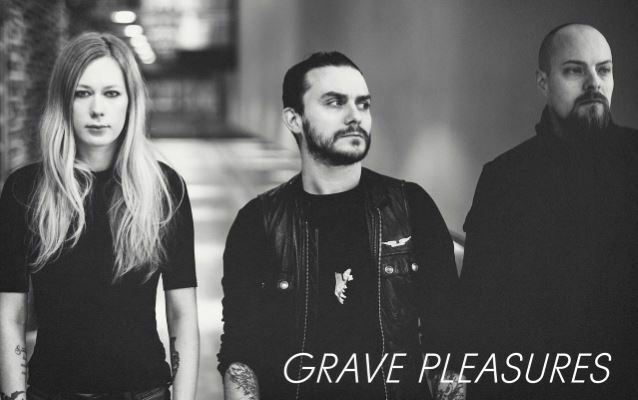 GRAVE PLEASURES singer Mat "Kvohst", who wrote the material on BEASTMILK's debut album, 2013's "Climax", says of the name and lineup change: "The lineup has never been stronger! "We're really excited to perform material from the forthcoming album and classic songs from 'Climax'. "The name might change, but the songs and the performance will be better than ever."